Looking to add a little rustic appeal to your store? 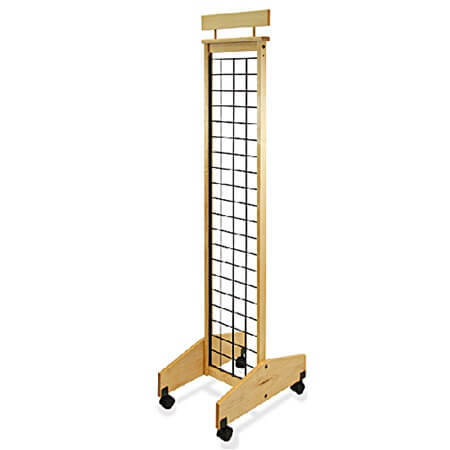 Our 2-Sided Mobile Wood Gridwall Display is approximately 13 inches wide and stands over 68 inches tall and includes a wooden sign holder that sits on-top of the display to advertise your merchandise from across the room. The wire grid panels have three-inch on center space for you to add accessories such as hooks, shelves, brackets and so many more. Add this natural wood display to your store or cafe if you are looking to add a little country appeal. This mobile display comes with lockable caster and allows you to easily and quickly move your display to where it is needed to display all your merchandise and catch the customers eye. Add this freestanding exhibit to your bakery and fill with fresh baked goodies, in your retail store filled with impulse materials or in your snack aisles filled with yummy and delicious chips, cheese and cracker snacks and more. Ordering is easy simply add to your online shopping cart today!